Not a good season opener as the Bucs lost their first game of the year for fhe third straight season. Eight turnovers including six interceptions, although three of Jack Thompson's picks were deflected balls. 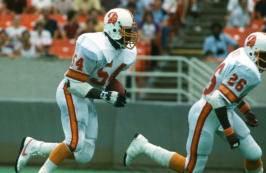 Thompson did hit Gerald Carter on a second quarter bomb that did give the Bucs a short-lived lead. 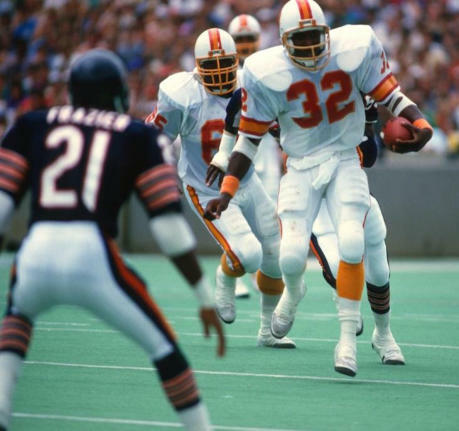 The three Chicago TD drives in the second half covered a total of 25 yards following three of the Tampa turnovers. 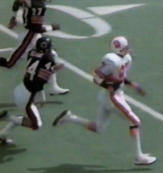 Steve DeBerg relieved Thompson in the fourth quarter and did throw a late scoring pass to James Owens. INDIVIDUAL STATISTICS RUSHING BUCS: Wilder 16-73, Thompson 1-13, Armstrong 1-3. BEARS: Payton 16-61, Suhey 14-57, Thomas 4-25, McMahon 3-21, Jordan 3-18, Gentry 7-5, Hutchinson 2-(-4). PASSING BUCS: Thompson 17-4-105-4-1, DeBerg 10-5-96-2-1. BEARS: McMahon 22-16-138-1-1, Avellini 1-1-17-0-0. RECEIVING BUCS: Carter 2-86, Wilder 2-56, Giles 2-41, House 1-12, Owens 1-4, Armstrong 1-2. BEARS: Payton 6-18, Suhey 4-30, Gault 2-40, McKinnon 2-23, Saldi 1-20, Baschnagel 1-17, Gentry 1-7. INTERCEPTIONS BUCS: Brown 1-14. BEARS: Fencik 2-64, Harris 1-34, Singletary 1-4, Richardson 1-0, Schmidt 1-0. KICK RETURNS BUCS: Owens 4-61, Morton 2-54, Wood 1-6. BEARS: Cameron 2-37. PUNT RETURNS BUCS: T.Bell 1-0. BEARS: Fisher 2-13. SACKS BUCS: Washington 1-8, Green 1-3. BEARS: Keys 1-15, Hampton 1-11, Hartenstine 1-10, Singletary 1-0.